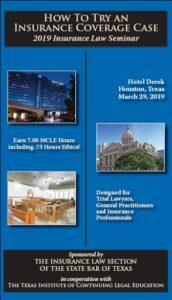 The Insurance Law Section and Texas Institute of CLE held the 2019 Insurance Law Seminar – “How to Try an Insurance Coverage Case” — March 29, 2019 at the Hotel Derek in Houston, Texas. Current Insurance Law Section members and/or corporate counsel received a discount on registration. If you missed it, order the audio CDs and/or course materials! Download the conference brochure or click here to order the course materials online via the Texas Institute of CLE website.